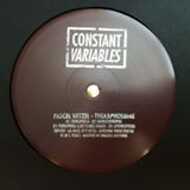 Constant Variables is the new techno offshoot of the enigmatic electro label, Expansion Unit. The label’s inaugural release comes courtesy of Berlin’s Pascal Hetzel, who is one of the driving forces behind Constant Variables. The EP features two expertly layered exercises in techno hypnosis as well as a slamming white-knuckle remix by Luis Flores and a murky excursion into drone-y ambient territory.